It has been pretty hot in London in the last few days and this vibrant green and simple recipe is all you may want to cook without spending too much time in the kitchen. Easy and healthy. Well, who doesn’t remember Popeye flexing his biceps? 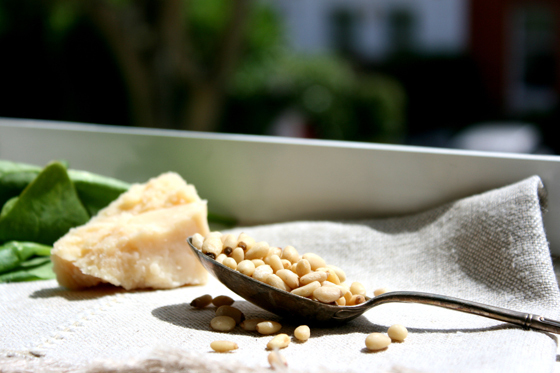 In a small frying pan set over medium heat, toast the pine nuts for 3-4 minutes, until lightly golden and fragrant. Set aside some of them for garnish. 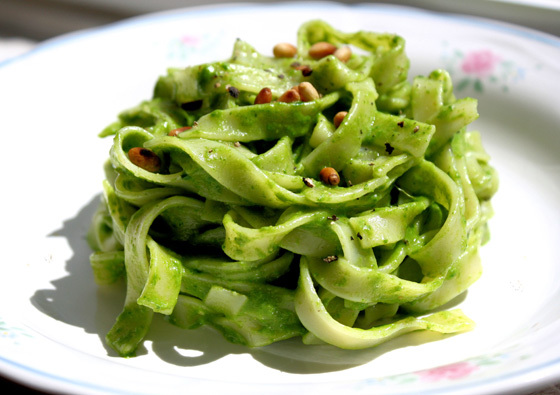 Place the baby spinach with the Parmigiano Reggiano cheese, garlic, pine nuts, extra -virgin olive oil, lemon juice and lemon zest in a food processor. Process, pulsing it, until almost smooth, occasionally stopping to scrape down with a rubber spatula the sides of the food processor. Bring a large pan of slightly salted water to a boil, add the tagliatelle and cook according to the package instructions. Drain the pasta. Transfer it back into its pan. Add the spinach sauce and toss to coat for about 10 seconds on medium heat. Serve right away, sprinkling each portion with some pine nuts and black pepper. 180°C, stirring occasionally, until golden-brown, 5 to 10 minutes. A quicker way to toast them is to put the nuts in a non-stick pan and cook over medium-low heat, stirring frequently, until golden in spots, about 3 minutes.